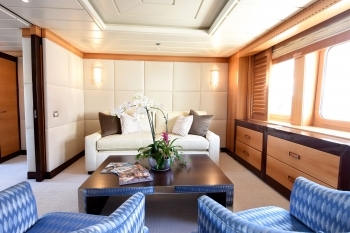 Available in the Western Mediterranean for Summer 2017, the luxurious, master stateroom aboard the 170′ motor yacht NITA K II sports not only a private sitting room and a full beam marble bathroom, but a full-beam dressing room too. 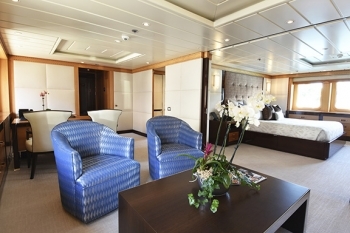 It also has a private staircase, connecting it to the skylounge with bar on the bridge deck that converts to a cinema by night. 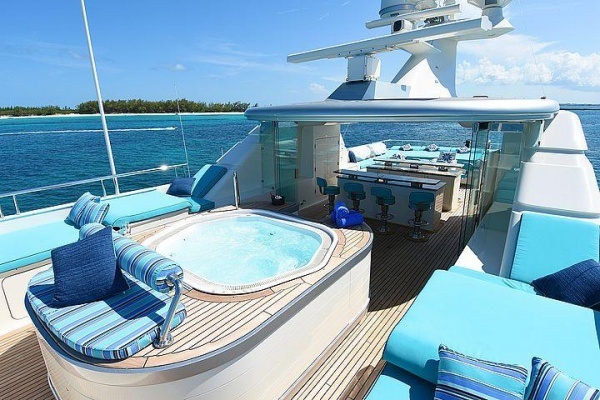 The folding glass wall on the sundeck shuts out strong Caribbean and Mediterranean breezes, so guests can use the swim-up Jacuzzi bar on windy days, while running. 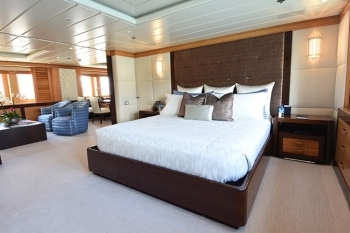 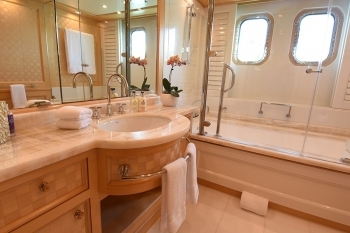 In addition to the master cabin located on the main deck, NITA K II accommodates eight additional guests in four, equal, spacious Queen cabins below, where wicker paneling contrasts with fine maple paneling, and each stateroom has an onyx bathroom with luxurious robe. 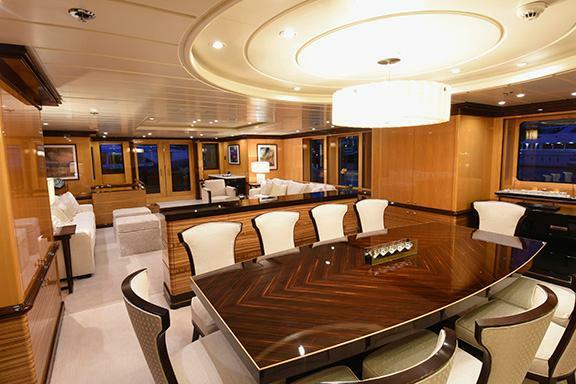 Doubling as a boardroom conference center, the bright, white dining room has a gold chandelier, wine cabinets, and pop-up TV. 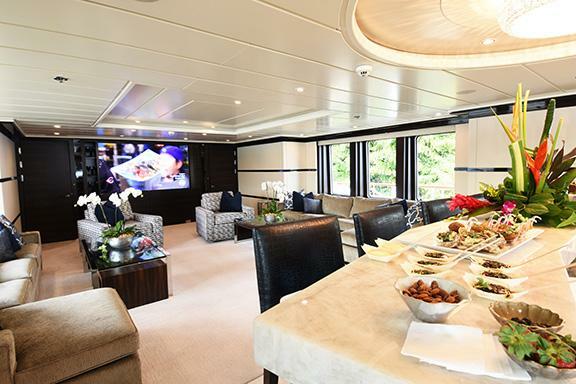 Guests have the choice of two places to eat: the formal dining saloon with gold chandelier and crystal-fronted wine cabinet, or the upper aft deck with long, varnished dining table with comfortable wicker seating. 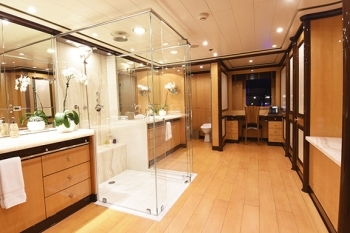 NITA K II recently completed an extensive refit including updating all soft goods, updating all bathrooms, adding 2 generous sized Pullmans, adding bars to both the sky lounge and sundeck and more. 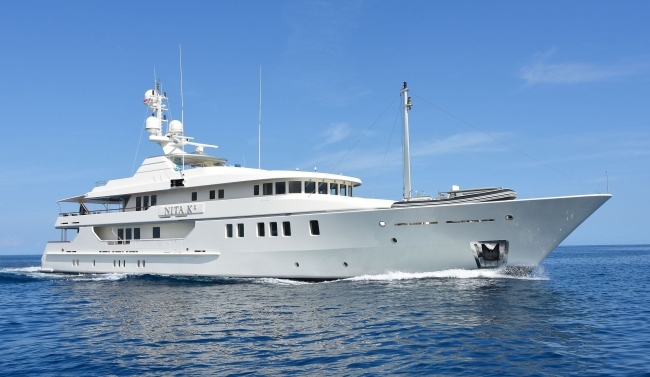 Following her Winter 2017 Caribbean season, NITA K II will charter in the West Mediterranean and is accepting bookings for the Cannes Film Festival and Monaco Grand Prix.